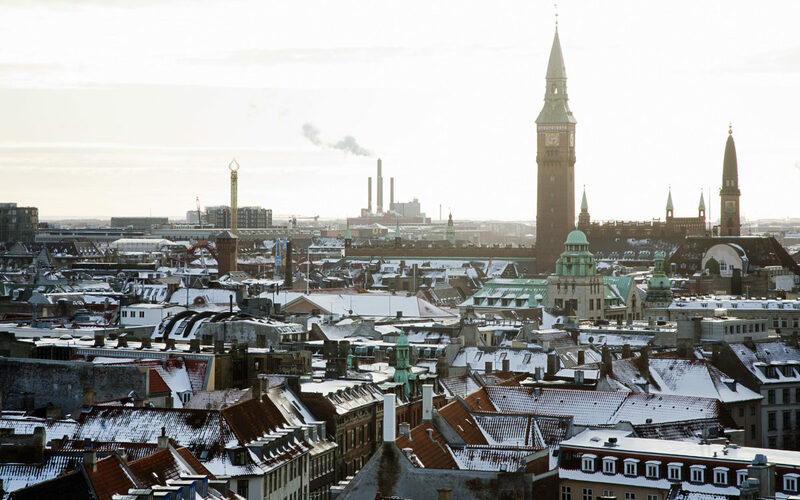 Launched in 2009, the VINK programme is Copenhagen’s flagship initiative engaged in directly tackling radicalisation, countering violent extremism, and reducing risk across the community. The VINK unit comprises a multi-agency group of experts and practitioners, including frontline and street workers, youth support teams and mentors, teachers, people with a strong knowledge of extremist movements and radicalisation, and those from minority backgrounds. In addition to the VINK unit, Copenhagen has an SSP team (Schools, Social Services & Police), building on the nationwide SSP model which draws on strong inter-agency cooperation. The SSP model in Denmark developed initially in the 1970s as a key crime prevention partnership between core agencies, with inter-agency information sharing protected under Danish law. Copenhagen also has a dedicated Anti-Radicalisation Task Force as part of a broader four-year city-wide integration agenda launched in 2015. The Task Force provides advice and recommendations to on CVE and integration measures to the municipality. The city also has a Radicalisation Standby Unit comprised of VINK, SSP Copenhagen and the Copenhagen Police. The Danish Government has a developed approach to countering violent extremism and preventing radicalisation. Key to the Danish strategy is empowering and working with local municipalities and strengthening multi-agency partnership at national and local levels. Denmark’s 2009 national action plan set out initial national policy on prevention, drawing on a series of initiatives to promote international development and cooperation, increase domestic efforts against discrimination and intolerance, and ensure strong integration, intercultural dialogue and equality of opportunity. 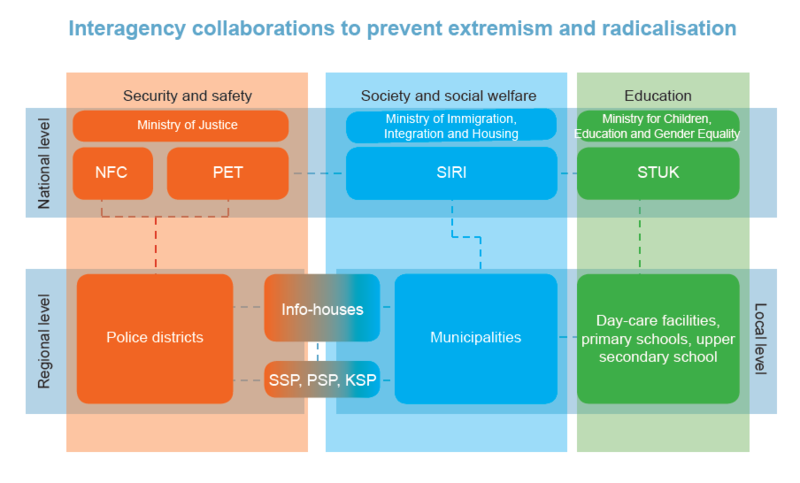 An updated 2014 national action plan placed further emphasis on the involvement of local authorities and civil society actors in prevention activities and the development new tools for prevention and exit work, tackling online radicalisation whilst also supporting those wanting to leave extremist groups. The current Danish National Action Plan, launched in 2016, sets out existing national policy, including improved national and regional coordination and knowledge-sharing on prevention efforts, guidance and training for local police districts, and direct support to help municipalities develop their own local action plans. It outlines strict measures targeting foreign fighters and criminal groups and increased efforts to counter radicalisation in prisons and schools, as well as a greater focus on targeting specific at-risk groups and communities and strengthening local community prevention. It also demonstrates an enhanced international effort, which includes strengthening the Danish contribution to the global coalition on countering ISIL, greater information sharing on foreign fighters, and the support of international prevention projects, including through the Strong Cities Network. A crucial part of the Danish multi-agency approach is the well-established networks of School, Social Services & Police (SSP), the networks of Prison and Probations Services, Social Services & Police (KSP), and the networks of Psychiatry, Social Services & Police (PSP). Such multi-agency cooperation and associated frameworks for inter-agency information sharing is regulated by Section 115 of the Danish Administration Justice Act. This stipulates that authorities can share information about an individual if necessary to support cooperation in crime prevention or to support cooperation between the police, the social services and social psychiatry and mental health authorities in their efforts to identify and support socially vulnerable individuals. Information may not, however, be shared for the purposes of criminal investigations. 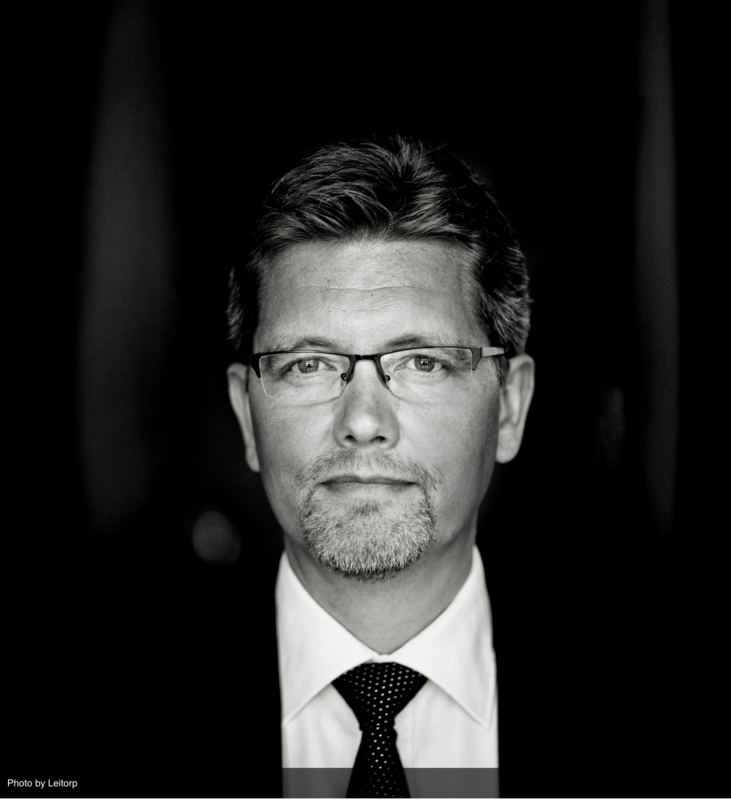 The Danish national strategy is led by a Government ministry and supported by the Danish Security and Intelligence Service (PET) through its Centre for Prevention. Since 2009, the City of Copenhagen has operated a hotline providing assistance and advice to parents, relatives, frontline workers such as teachers, and others who are concerned that an individual is at risk of radicalisation or already part of an extremist environment. Cases of concern are passed on to The Copenhagen Coordination Unit. A large majority of referrals do not require an in-depth one-to-one follow up. In 2015, the radicalisation hotline received 100 calls, 18 of which were passed on for individual counselling through a mentor or parental coaching program. The coordination unit consists of VINK, SSP, Copenhagen Police and the municipal gang-exit unit. The Danish Probation Services participate on an ad-hoc basis whenever a case involves a prisoner, as do the psychiatric authorities whenever relevant. The partners screen each individual case based on the information that has been provided to the hotline as well as relevant background information already stored in the municipal or police systems. The unit can decide to close the case if it does not involve radicalisation or it can decide to arrange for a meeting with the citizen with the aim of setting up a mentor program (see below). VINK’s mentoring programme provides one-to-one counselling for youth who are at risk of radicalisation, and also provides support for the parents of those both ‘at risk’ and who are already radicalised. This includes counselling for youth who are at risk of leaving the country to join violent extremist movements, as well as those further along the path who have already travelled, and those who have returned. VINK employs 17 counsellors, including 4 to 5 who work specifically with parents. All of them have a background in working with vulnerable youth. On average, a counsellor spends around 4 to 5 hours per week with their mentee, but at times of emergency the mentor can spend up to 12 hours a week. VINK mentors follow a two-way approach of support which is aimed at challenging the individual’s radical viewpoint, but also takes account of the fact that many young citizens who are referred to the programme are already finding themselves on the fringes of society. The former is centred on enhancing critical thinking skills and, importantly, encouraging their mentee to move away from their black and white worldview, for example through introducing them to new people and alternative ways of viewing society and people around them. The latter focuses on supporting youth in fulfilling their basic needs – both physically and mentally – including help with attending school, finding a job or managing difficult family relationships. In 2015, the VINK mentor programme supported 18 cases, with many cases of female returnees from Syria. The length of support an individual receives is decided on a case-by-case basis, rather than being dictated by set frameworks. With the Ministry of Justice heavily invested in CVE work across Denmark, work to counter radicalisation, as well as targeted de-radicalisation and disengagement interventions is a key focus area. With core involvement from prison and probation services, the Danish Security and Intelligence Service (PET) and other agencies, policy in this field is necessarily governed at the national level, rather than the local. Past schemes include the ‘Back on Track’ initiative (launched 2011), which delivered targeted intervention and mentoring for prisoners, aimed at de-radicalisation for extremist offenders as well as support for other prisoners identified as at risk of extremism and radicalisation. It also incorporated guidance and training for prison officers on how to identify signs of radicalisation and violent extremism among prisoners. Back on Track built on the previous ‘De-radicalisation – Targeted Intervention’ plan, which emphasised multi-agency partnership, particularly involving the PET, East Jutland Police and the municipalities of Copenhagen and Aarhus. More recent initiatives have led by the Prison and Probation Services have succeeded the ‘Back on Track’ initiative, with work in prisons and with prisoners on probation remaining a key area of focus for CVE across Denmark. The Danish Security and Intelligence Services (PET) play a leading role in countering violent extremism across the county, with direct involvement in many intervention cases, leadership on matters involving criminal investigation, and the sharing of knowledge and expertise to bolster the capacity of other frontline services, including regional police forces. Specific PET initiatives include the Dialogue Forum, held a few times a year, as a roundtable meeting between PET and Denmark’s Muslim community to discuss various issues related to violent extremism. The PET also hosts other civil society projects targeting a wide range of citizens from different backgrounds.